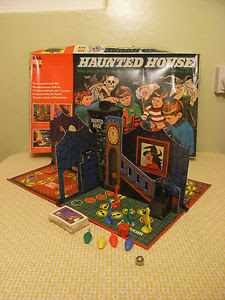 "The Haunted House Game." Today we get to see how you turn a haunted house into a game, apparently. Is it a board game? Like Monopoly but the properties are spooky? Monopoly teaches us that the only horror in this life is capitalism. I am running out of ways to introduce stories. Let's just read the damn thing. Jonathan is babysitting his 2 younger siblings with his best friend Nadine. The night is dark and stormy, which means it is a perfect time to play the board game called Haunted House. Each player rolls the dice, and the square they land on has a spooky direction. The thing is, what they read on the board happens in real life. One square may say they hear the windows rattle, and the real windows actually rattle. Another square may say you hear an eerie moan and one actually sounds out. Very creepy. Of course every game must end. Jonathan lands on the square marked "Scared to Death." Basically every scary thing that could happen. There were lightning blasts, thunder booms, moaning, screaming, rattling windows. The kids screamed for what seemed like hours. Jonathan tried to escape the house but curiously stopped at the newspaper out front. The paper had an article about 4 kids who died mysteriously in a mansion. It appears like they were scared to death... in 1942. So that's how long they've been haunting this place. Jonathan returns to the house, his siblings are still in there. For some reason he goes to the closet. There is a board game in there called Haunted House. Boy, it would be a great night to play it. This tale has a fun premise, albeit one that is not too far off from other stories out there. 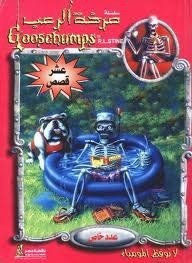 While it feels like other stories per say, it doesn't feel quite like other Goosebumps stories, so that is good. The idea is pretty simple but effective. I do think the frights have a lot more to offer the young than they do for me. Reading about thunder and moans and rattling just doesn't do it for me anymore. Lots of these stories feel like they have a particular time that it would be good to read them to other people. Babysitting kids on a stormy night, this would be a great one to take out. You might not be invited back to babysit again... but oh well. I guess basically this is a pretty fun story. The twist isn't a showstopper, and I probably should probably be complaining about how it's a "they were dead the whole time" one... but it works. The whole "stuck like this for eternity" has also been done before, but I think it is done here well for once. This is one of the better "Tales" I've read thus far. Tomorrow I'll read "A Change for the Strange." Who knows if it will be scary, but at least it will be strange. See you then.